T24959 is rated 5.0 out of 5 by 2. 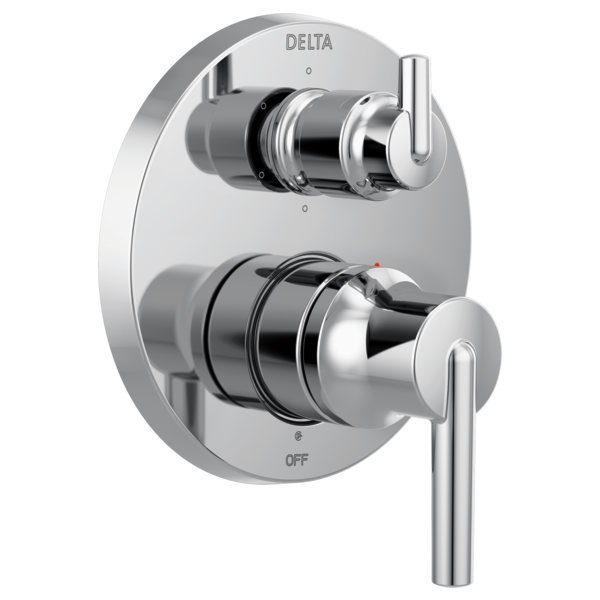 The Delta® MultiChoice® Integrated Shower Diverter consolidates custom shower design with its consumer-preferred streamlined style eliminating the need for an additional diverter valve. The contemporary round style is a smooth take on modern geometrics, offering a fresh look which can complement a wide range of decor. 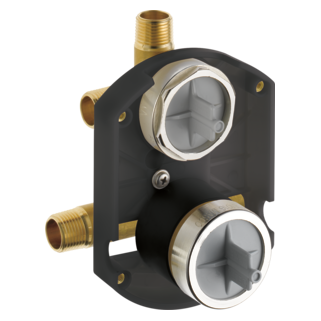 With three popular style choices to coordinate with any bathroom décor, it provides you the flexibility to select the type of custom shower functionality you prefer. With the MultiChoice® Universal system, you have the freedom to upgrade style and functionality later. And, because there’s no need to alter plumbing behind the wall, you save time, effort and money on future renovation updates. Rated 5 out of 5 by HollyBeroInteriors from Great look and function Clean lines and mordern look. What materials are the components of this trim kit made from? what tub spout would correspond with trim?